Renewable energy technology can meet the energy needs of remote communities if local renewable energy resources are available and if it is deployed in a way that meets reasonable community expectations, thus allowing it to diffuse into the local culture in a process that can be called renewable energy technology acculturation. This paper analyzes renewable energy technology acculturation using Dobrov's conceptualization of technology as hardware, software, and orgware; Bourdieu's categories of objectified, embodied, and institutionalized cultural capital; and Rogers' concept of diffusion of innovations. Using qualitative enquiries, this study combines literature research, field research, and in-depth interviews to understand the extent to which renewable energy technology diffuses into and is assimilated by remote communities. It uses a combination of concepts developed by Dobrov, Bourdieu, and Rogers that we call the KPDAC (knowledge, persuasion, decision, adoption, confirmation) model of acculturation. A case study of the acculturation of a photovoltaic-wind-diesel hybrid power system installed in the village of Oeledo in eastern Indonesia is used to illustrate the practical application of the KPDAC model. Results indicated that from a cultural perspective, despite long-term sustainability challenges, the hybrid power system has been successfully integrated into Oeledo village life. Combining the concepts of Dobrov, Bourdieu, and Rogers proved to be useful in understanding the requirements for successful renewable energy technology acculturation in the remote Indonesian community of Oeledo. This has relevance for the analysis and design of similar projects elsewhere in Indonesia and in other countries that have similar characteristics. Renewable energy technology (RET), sometimes in conjunction with fossil fuel technology, can be an appropriate way to meet rural energy needs where access to conventional energy supply is restricted, provided that local renewable energy resources are available and RET is deployed in the way that meets reasonable community expectations. Diffusing RET into a rural setting, particularly when community members lack familiarity with the technology, requires significant endeavor to incorporate it into the pre-existing culture. The process can be likened to a marriage between the newly introduced technology and the pre-existing local culture, the success of which is highly dependent on RET attributes and the scale of the RET project relative to the community's pre-existing situation, community culture characteristics, community expectations of RET, and how the acculturation process is managed. RET acculturation is defined here as the process by which RET diffuses into and is assimilated by a community. This paper explores whether an active acculturation process, if designed and deployed in a manner that considers the challenges discussed above, can facilitate RET acculturation into remote community culture. This paper provides an independent assessment of an off-grid photovoltaic-wind-diesel hybrid system project in the village of Oeledo, located in the Nusa Tenggara Timur (NTT) province of Indonesia. This assessment is based on the field research by the first author in Oeledo in 2005  with more recent updates from workshops, interviews, and literature review. The Oeledo project was conceived and managed by the then E7a, the Government of Indonesia (GOI), the NTT (eastern Indonesia) Provincial Government, and the NTT-based non-governmental organization (NGO) Womintra. In what follows, these parties will be described collectively as the project proponents. The Oeledo project was one of a number of projects developed in collaboration between the E7 and the GOI with an overall budget of US$1.8 million. In the other projects, four micro hydro systems and 200 solar home system units were installed in other parts of NTT province and the province of South Sulawesi , p. 10b]. We use a combination of the following concepts in our analysis: Dobrov  conceptualized technology as a three-dimensional construct of hardware (equipment), software (skill, knowledge), and orgware (institution, network, rules, norms); Bourdieu  defined categories of objectified, embodied, and institutionalized cultural capital; and Rogers  introduced the concept of diffusion of innovations. We use Dobrov's work to provide a holistic understanding of technology, Bourdieu's work to define the key objectives of acculturation, and Rogers' work to explain the stages of acculturation and the roles that actors (RET providers, facilitators, and users) play in the process. Oeledo is an off-grid coastal village located on Rote Island, a small island of 1,300 km2 at 11°S and 123°E that is the southernmost Indonesian island and borders on Australian watersc. To visit this remote community, one must first fly to Kupang, the capital city of NTT Province, then take a 4-h ferry trip from Kupang to Rote's main harbor of Pantai Baru and then a 2-h journey by motorbike or robust four-wheel drive vehicle over a bumpy, hilly, rocky, and dusty road. When visited by the first author in 2005, Oeledo was a home to 354 families and was a typical example of a remote community living in an isolated and dry tropical climate. Temperature range in the NTT province, including Oeledo, is 20°C to 37°C with 8 months of dry season. At that time, the subsistence livelihoods of the Oeledo villagers depended on small fishing boats and Lontard or Palmyra palm trees (Borassus flabellifer)  visible in the background of the photograph in Figure 1(a). In 2005, electricity supply was available in only 20% of NTT province and electricity consumption averaged 61 kWh per capita per year, which is approximately one tenth of average Indonesian per capita electricity consumption . Oeledo power station and its single-line diagram. (a) The E7 photovoltaic-wind-diesel hybrid power station and Pengelola Listrik Desa office in Oeledo. (b) Single-line diagram of the Oeledo E7 hybrid power system, based on , p. 7]. From 1996 to 1998, the project proponents undertook a feasibility study, socioeconomic and environmental assessments, site selection, and procurement for the Oeledo project. They commenced construction of Oeledo's photovoltaic (PV)-wind-diesel hybrid power system in 1999, which was then operated by a locally established village electricity management committee (Pengelola Listrik Desa - PLD), formed among the electricity users. This Activities Implemented Jointly (AIJ) project was designed as a prototype Clean Development Mechanism (CDM) project, intended to provide practical lessons in terms of technology transfer, capacity building, and greenhouse gas (GHG) emission reductions. Oeledo village was chosen because of sufficient solar insolation and wind energy resources, its isolation from the electricity grid, and its socioeconomic situation with potential users, albeit poor, who showed a willingness and ability to pay for the operation and maintenance of the electricity service , p. 18]. In the period July 2000 to June 2003, measured solar insolation at the project site was in the range of 1 to 7 kWh/m2/day, and the measured monthly average wind speed was in the range of 1 to 5 m/s with higher wind speeds between May and August compared to other times of the year . The electricity-generating equipment installed at Oeledo comprised a 256 module, 22-kWp PV array, 10-kW wind turbine, 20-kVA diesel generator, 120 2-V deep-discharge lead acid cells providing 144-kWh battery storage, and two 20-kVA self-commutating inverters , see Figure 1(b). Electricity is distributed to households by means of an overhead 220-V single-phase distribution network. This electricity supply system provides an average of 48 kWh/day to a group of 127 connected households, each of which has a load limiter set at 0.5 to 2 A, depending on the level of monthly subscription each household has agreed to pay. The 127 early-adopter households benefited from a low connection fee as part of the project design. The hybrid power system design capacity was 144 kWh/day; however, the lower than anticipated initial daily demand, at 48 kWh/day, could usually be met by PV and wind alone, with the diesel generator on standby for occasional operation when required. In the period July 2000 to June 2003, PV production fluctuated between 45 and 90 kWh/day and wind production fluctuated between 5 and 60 kWh/day . Spare solar and wind production capacity was offered to late adopters (subject to the cost of network connection) and used to provide commercial battery recharging services for non-subscribers in Oeledo and people from nearby villages. The villagers were initially skeptical about the idea of generating electricity from sunlight and wind although some already had small portable diesel generators. Womintra, an NTT-based NGO that was familiar with the local culture, facilitated the project deployment and acculturation. From 1 year prior to hardware installation, Womintra field officers were stationed in the village for up to 2 years to familiarize the community with the project, facilitate the establishment of the PLD, and train the PLD officials in technical, financial, and micro-utility management skills. Among other strategies, they used a stand-alone solar PV system to demonstrate that sunlight could indeed be converted into electricity. To avoid the so-called dropout syndrome referring to ‘trainees leave the project after successful training’ , p. 33] a village meeting elected members of the PLD who were deemed reliable and committed. PLD members built the PLD office, defined the rules such as office hours, meeting schedule, and penalty mechanisms for non-compliance. PLD meetings determined the salaries that the PLD officials would earn and regularly reviewed system operation and finances. To maintain financial integrity and transparency, withdrawal from the PLD bank account required two signatures - head of the PLD and the head of the village. As shown in Figure 2, the project had three management levels to combine a top-down approach (E7, GOI, and E7 Project Office for project concept and design) with a bottom-up approach (PLD and E7 Project Office level for project implementation, operation, and management). Users were involved in the decision-making process through the village PLD, focus group discussions, on-the-spot assessments, and individual interviews for the non-engineering issues that had to be resolved. The Oeledo project institutional arrangements or orgware. The project included an economic empowerment program that facilitated the formation of local cooperatives to develop and market Oeledo's Palmyra-based handicrafts and fishing. The hybrid power system increased Oeledo's per capita monthly income by a factor of 10 from 62,000 rupiahs (approximately US$ 62) in 1999 to 620,000 rupiahs in 2007, and the accumulated operating surplus exceeded 120 million rupiahs in 2008 , a significant amount for the village. Unfortunately, the operating surplus had to be spent on, among other things, replacing batteries and paying overseas experts to repair some foreign-sourced components of the hybrid system. The PLD chair lady, interviewed in 2005, was concerned that the remaining surplus would not be sufficient to finance future hardware replacement and suggested that cheaper Indonesian stand-alone solar home systems (SHS) might be adopted when the hybrid system failed. In 2007, 82 more families enlisted to subscribe to electricity supply, and the local government devised a financial scheme to subsidize the down payment for the US$90 connection cost as the distribution network had to be extended and material procurement had become more expensive. Also, the funds originally provided by the E7 had already been spent by 2007. From a cultural perspective, the hybrid system was successfully integrated or diffused into Oeledo village life, being assimilated well by the community into its ongoing practice. In addition to the per capita income improvement, villagers enjoyed television (TV) shows in the house of a wealthy family who owned a colored TV and a parabolic antenna, which became a routine social gathering. PLD officers are being considered for promotion in the local government civil service. The project received an ASEAN Energy Award in Manila in June 2004e, and by 2005, visitors from more than 30 countries had visited Oeledo to learn about this rural electrification project. Dobrov , p. 85] viewed a technological system as a ‘three-dimensional technological entity’ of hardware, software, and orgware, a viewpoint he regarded as necessary to understand modern ‘advanced-systems-integrated organized technology’ , p. 79]. In Dobrov's nomenclature , p. 82–83], hardware refers to ‘technical means’ such as apparatus, machines, and computers; software refers to ‘methods of operating’ such as instructions, programming, skills, and knowledge; and orgware refers to ‘policy power’ or ‘a set of organizational arrangements specially designed and integrated using human, institutional, and technical factors to support appropriate interaction of the technology and external systems’, which include laws, regulations, organizational structure, networks, and management. Dobrov insisted that as the nature of a technological system progressed from simple and conventional to a more advanced level, so did the degree of complexity and the need for organizing the hardware, software, and orgware into a more integrated system, as well as for integrated technology management and policy making. Orgware refers to project structure, organization, and management, comprising the roles of all stakeholders and rules of the game in project design, deployment, operation, financing, equipment end-of-life decommissioning, and project extension or replacement. The complexity of the Oeledo project lies primarily in the orgware and software. This is because its deployment and operation involved multiple stakeholders from international organizations, as well as federal-, provincial-, and village-level governance in Indonesia. Deployment as an AIJ or CDM prototype project added further complexity as the project goals were to explore RET transfer, capacity building, and GHG emission reduction, with institutional, financial, technological, social, and environmental objectives. Deployed as a model for small-scale decentralized electrification, the hybrid system differs significantly from a conventional centralized system in that software and orgware for project operation must be largely delegated to the local community. Dobrov insisted that orgware ‘has to provide the necessary conditions for the utilization of decision makers' skills and the interaction’ of different systems or cultures , p. 81]. As summarized in Table 1, the Oeledo project is complex and requires a body of orgware to deliver the hardware and software at both ‘macro’ and ‘operative’ , p. 81] levels. A combination of top-down (project concept and technical design) and bottom-up (field implementation design) approaches was used at the macro and operative levels, respectively. Womintra played a critical role as facilitator in bridging the gap between the macro and operative levels, taking local capabilities into account. For example, E7 reported ‘management tools were adapted to the micro project environment with the local capability in mind’ , p. 3]. This illustrates the importance of orgware design in achieving the intended outcomes from a complex project. With such complexity, effective orgware was essential for successful transfer of software (skill, knowledge) and hardware (physical equipment of the hybrid system), validating Dobrov's view of the importance in viewing technology ‘as-a-whole’ . The Oeledo project initially exhibited a chasm between the technology provider and adopter in terms of technological capacity, which required effective capacity building to overcome. Viewing technology in a holistic manner, as described in earlier section, is the first step. However, Bourdieu's  concept of cultural capital is instrumental in explaining why capacity building is required and what form it should take. This is the subject of this sectionh. Bourdieu first introduced the concept of cultural capital in the context of socioeconomic disadvantage to ‘explain the unequal scholastic achievement of children originating from the different social classes’ by relating academic success to the specific profits obtained in the academic market , p. 243]. We could use the concept of cultural capital to compare the performances of different households in acculturating RET. However, this paper focuses on the process of transmitting cultural capital at the village level. Objectified cultural capital, which he defined as ‘trace or realization of theories … objectified in material objects and media, such as writings, paintings, monuments, instruments, … machines, etc.’ , pp. 243–247]. Parallelism with Dobrov's  concept of hardware is evident, and in the Oeledo case, objectified cultural capital comprises the equipment used for electricity generation, distribution, and consumption, which is ‘transmissible in its materiality’ , p. 246]. Embodied cultural capital, which Bourdieu defined as ‘long-lasting dispositions of mind and body’ , p. 243], comparable to Dobrov's software (skill and knowledge), the transfer of which requires investment in time and effort for acculturation or ‘assimilation’ in Bourdieu's terminology , p. 244]. In the context of the Oeledo project, this refers to the information, skill, and knowledge to operate and maintain the project hardware as well as the technical and managerial skills required to run the PLD utility. Institutionalized cultural capital, which Bourdieu defined as ‘educational qualifications, , p. 243], instituted through education and training. Embodied cultural capital, possessed by an individual agent (e.g., talent, autodidact), implies a biological constraint as ‘it declines and dies with its bearer’ , p. 245]. Institutionalized cultural capital overcomes the biological constraint of embodied cultural capital through replication. This is parallel to Dobrov's concept of orgware in which the provider and facilitator provide education and training for the purpose of embodiment of cultural capital. In the Oeledo context, institutionalized cultural capital refers to the project organization structure comprising all stakeholders to facilitate exchange of knowledge and expertise. In its objectified state, RET hardware can be possessed materially by purchase as consumer goods if one has economic capital (or access to economic capital) or by receipt as a gift. However, to fully appropriate RET energy services, one first needs the relevant RET software, or RET embodied cultural capital. This requires a ‘process of embodiment, incorporation, which implies … a labor of assimilation’ , p. 244] in which the appropriator must personally invest as, ‘like the acquisition of muscular physique or suntan, it cannot be done at second hand’ , p. 244]. Thus, if RET is to be fully integrated into village culture, villagers must first actively engage in skill development as RET software (skill, knowledge) ‘cannot be transmitted instantaneously’ by gift or purchase , p. 245]. Orgware, in the form of a cultural capital institution, is required to facilitate RET transmission from the initiator (project provider or initial holder of cultural capital) to the appropriator (the village community). From the perspective of cultural capital, the institutional arrangements for technology transfer shown in Figure 2 can be redrawn as orgware for cultural capital transmission as depicted in Figure 3. Table 2 summarizes the Dobrov and Bourdieu concepts as applied to the Oeledo project. The transmission orgware for the Oeledo project cultural capital. RET hardware can be treated as consumer goods if a village already possesses sufficient embodied RET cultural capital to allow villagers to install, operate, maintain, and decommission the equipment. This situation can be likened to Bourdieu's narratives on ‘hereditary transmission’ , p. 245] of cultural capital or cultural capital previously invested to provide a head start for further reproduction or enrichment. Where there is insufficient embodied cultural capital, ‘dumping’ RET hardware in an off-grid village in a short-term project focusing primarily on the hardware may result in the hardware being abandoned as a ‘white elephant’ - an ‘artifact’ that remains alien to the village culture and incurs ongoing cost to the community. The skeptical initial response of the Oeledo villagers toward the idea of generating electricity from sunlight and wind indicated that the village did not possess RET cultural capital prior to project commencement. The villagers were also unfamiliar with the idea of a PLD to manage village electricity supply. Thus, the RET hardware, software, and orgware were all new to the Oeledo community, indicating the great chasm between the project initiator and the intended appropriator of the RET. Therefore, to fully appropriate the RET, the Oeledo villagers needed access to its embodied cultural capital prior to hardware installation. The process of transferring cultural capital entailed investment in time and effort by the initial holder (E7), the facilitator (Womintra), and the appropriator (the Oeledo community). The initial holder (E7) provided the financial and managerial resources for the transmission of cultural capital as well as much of the RET cultural capital. The facilitator (Womintra) provided the remaining RET cultural capital and stationed field officers in the village for up to 2 years to transmit the RET cultural capital by familiarizing the community with the project, facilitating the establishment of the PLD, and providing technical and management training. This significant investment was required because the embodied RET cultural capital cannot be transmitted quickly. It takes ‘a labour of … assimilation’ , p. 244] and sufficient time to acculturate the alien technology, ‘into a habitus’ , p. 245]. The acculturation period must be sufficiently long to identify and solve problems arising from the differing interests of community members (for example, differences in ethnic background, social status, gender issues, etc.). The appropriator (the Oeledo community) needed to be actively engaged because the embodiment process cannot take place at second hand. Community members participated in technical and managerial training and in decision-making through village workshops, focus group discussions, and neighborhood discussions. These are ‘personal’ efforts to incorporate the new RET culture into a local ‘habitus.’ Participation facilitates a sense of ownership of the new cultural capital. The project orgware implemented technology transfer and capacity building in a coordinated top-down and bottom-up project structure. It provided an effective means of transferring the embodied cultural capital from the initial holders to the appropriator. The project timeline also prioritized transfer of orgware and software before hardware. Trouble-free deployment and ongoing operation of hardware throughout its technical lifetime requires the prior existence of a local capable agent and or institution (orgware) and the prior mastery of RET know-how (software). Trained personnel with their embodied cultural capital become part of the village's cultural assets. This highlights the importance of avoiding the so-called dropout syndrome because if trained technicians leave their posts, continuing operation of RET hardware may be placed at risk if they were the only holders in the village of the hybrid system embodied cultural capital. The dropout syndrome can be viewed as leakage of accumulated cultural capital. Thus, it is strategically important for the village to nominate trainee technicians who can be expected to remain committed to the village. Obviously, it is important to provide these new holders of embodied cultural capital with incentives to stay, safeguarding the village's new cultural asset. Fieldwork revealed that the village community respected PLD officials, demonstrating that, apart from the new job and salary, the PLD officials gained new social status. As previously discussed, Bourdieu explained this phenomenon as fungibility of the various cultural capitals. For example, cultural capital, institutionalized in the form of academic qualifications, is convertible into economic capital under certain conditions. The new skills and knowledge (embodied cultural capital) held by the PLD officials can be regarded as an informal academic or educational qualification , p. 242] that can be converted into economic capital in the form of salary. Similarly, social capital, institutionalized in the form of title or nobility, is convertible into economic capital under certain conditions. The new embodied cultural capital held by the PLD officials, apart from the income earned, can be regarded as an informal form of title or nobility , p. 242] that gave them new social status in the village as well as improved prospects for promotion in the government civil service. Thus, successful transfer of RET brought economic, cultural, and social capital, the fungibility of which added to the village's wealth. In addition, the international award and recognition given to the Oeledo project are forms of title or nobility earned by the community as a whole. In 2011, the 12th anniversary of the installation of the Oeledo RE system, the long-term sustainability of the Oeledo project remained uncertain. Financial sustainability had yet to be attained, as operating surpluses were insufficient to fund the replacement of the RET hardware at the end of its technical life. For example, the PLD managed to self-fund five new 2-V batteries in 2006 after 6 years' operation . However, in 2008, external funding by the E8 and the NTT Provincial governments was required to replace the remaining 115 2-V batteriesi and malfunctioning diesel engine components . Also, substantial funds were expended in bringing an overseas expert to repair faulty imported equipment. This can be viewed as a leakage of economic capital that could have been reduced by minimizing the use of expensive imported equipment. Consistent with this view, the chair of the Oeledo PLD foreshadowed that future electricity supply for the village would use cheaper Indonesian SHS. The ability to envision such an alternative demonstrates that the village has inherited a RET cultural capital legacy from the project that may provide the village with greater autonomy for future RET projects. Retnanestri  developed the KPDAC model to apply Rogers' work  on diffusion of innovations to RET acculturation and used the model as a means to understand the nature and requirements of the RET acculturation processj. According to Rogers, an adopter of an innovation (RET in this context) may undergo an innovation-decision transition from ‘gaining initial knowledgek of an innovation, to forming an attitudel toward the innovation, to making a decision to adopt or reject, to (if deciding to adopt) implementationm of the new idea, and to confirmation of this decision’ , p. 168]. Thus, facilitators must guide members of an adopting community through a sequence of steps if the community is to adopt RET and confirm its benefits rather than discontinue its use. See  for a more detailed discussion of the conceptual background to the KPDAC model. Table 3, based on Roger's innovation-decision process , pp. 168–170] and the role of the facilitator , pp. 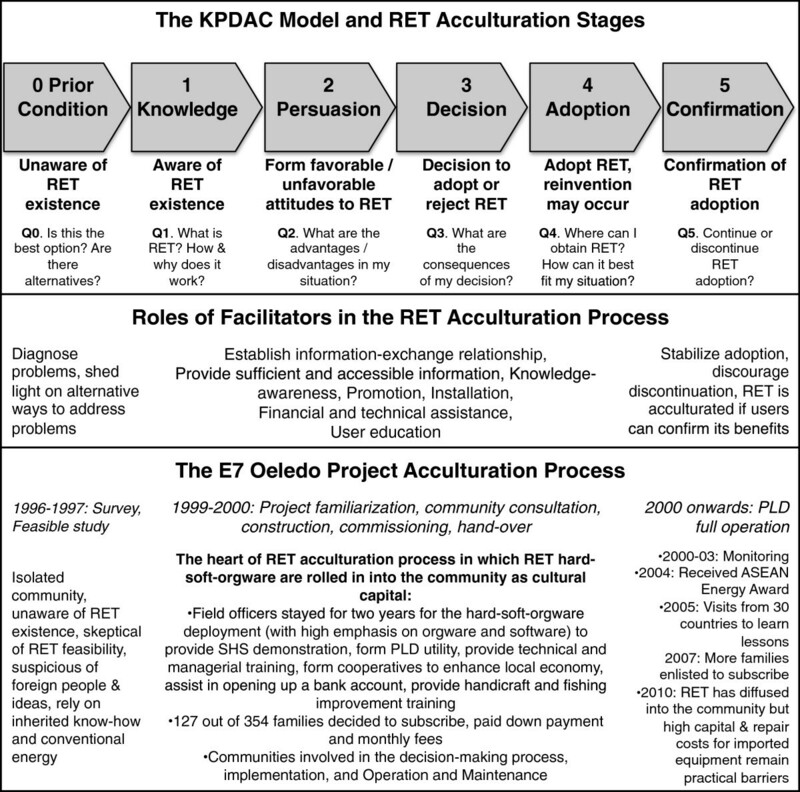 369–370], summarizes the five sequential stages of the KPDAC model for RET acculturation (stages 0 to 5), with associated questions (questions Q0 to Q5) for community members to consider and the corresponding roles of facilitators. Facilitators can be crucial in assisting the target community to answer these questions, including diagnosing problems with previous energy practices and suggesting improvements, providing information on alternatives (including RET), assisting in implementation, and suggesting ways in which users can continue to harness RET benefits, thus stabilizing its adoption. Establishing and maintaining community consensus are the key. Community energy service arrangements prior to the project. Felt needs and problems related to energy service. Q0: Is this the best option? Are there alternatives? Q1: What is RET? How and why does it work? Once community members have formed attitudes toward RET, a function of its perceived attributes. Q2: What are dis/advantages in my situation? Q3: What are the consequences of this decision? When the community starts to use RET; Reinvention may occur. Q4: Where can I obtain RET service? How can it best fit my situation? When community members consider extending or expanding RET use but may discontinue its use if experiencing difficulties. Q5: Continue or discontinue RET adoption? At persuasion (attitude forming) stage, the extent to which one forms a favorable or unfavorable attitude toward RET depends on its perceived attributes, which might include: (1) relative advantage - might it be better than existing practices; (2) compatibility - whether RET is perceived to be consistent with the existing values and objectives of the potential adopters; and (3) complexity - the degree to which RET is perceived difficult to understand and use. At adoption stage, reinvention may occur, in which adopters change or modify an innovation , p. 17] to fit their situationn. R&D agencies may dislike reinvention, calling it ‘noise’ or ‘distortion’ and believing that ‘they know best as to the form of innovation that users should adopt’ , pp. 180–184]o. While indicating a partial rejection, reinvention also indicates that adopters have become active players in the innovation process, or in other words, the innovation has been institutionalized or acculturated into the users' ongoing practices. At project start, villagers were skeptical about the idea of generating electricity from sunlight and wind due to their lack of understanding about the existence of RET and how it worked, so we classified them as being at stage 0 (prior condition). They were unaware of RET's potential advantages or if it would be compatible with their local cultural and social norms, thus they saw RET as alien. To achieve adoption, the facilitators had to work through all of the sequential innovation-decision stages: assess community energy service objectives; raise community awareness of the technology, its advantages, and how it could improve their situation; encourage the community to adopt it; and once the community had agreed to do so, maintain service continuity to deter discontinuation. Prior condition (stage 0 - aimed at answering Q0): Having selected Oeledo for potential installation of the hybrid plant, the facilitators then diagnosed the community's energy-related problems (geographical isolation, poverty, lack of access to energy service), assessing existing community capital (sunlight, wind, fishing, and Palmyra palms), motivating community interest in improving their situation by offering alternative energy options and explaining ways to achieve the objectives of changing energy practice (from the traditional energy being practiced to the use of hybrid system). Knowledge-persuasion (stages 1 to 2 - aimed at answering Q1 and Q2): (1) The facilitators demonstrated how sunlight could indeed be converted into electricity using a stand-alone solar PV panel, (2) they promoted and then established the PLD, and (3) they facilitated the formation of local cooperatives to develop and market Oeledo's products based on the economic potential of fishing and Palmyra handicrafts. The PLD was formed from community members who were potential users, who then nominated and elected executive officials such as the head, secretary, treasurer, and technicians. Womintra stationed field officers in the village for up to 2 years to familiarize the community with the project, facilitate PLD establishment, train PLD officials in micro-utility including technical, financial, and managerial skills and run an economic empowerment program. The KPDAC model and its application to the Oeledo project. All of that was consistent with the required roles of facilitator within these stages, which are as detailed in Table 3 and Figure 4: to establish information exchange relationship by creating knowledge awareness of RET, providing education and sufficient and accessible information, and promoting consensus among villagers. These are necessary steps to build trust within the village, while building community capacity in RET, all of which led to the next stage of decision and adoption. Decision-adoption (stages 3 to 4 - aimed at answering Q3 and Q4): 127 of the 354 families in Oeledo decided to subscribe to electricity supply, paying a down payment of approximately US$ 17.5 and monthly subscription fees corresponding to approximately US$9 cents/kWh. They were early adopters of the hybrid system, benefiting from subsidized cost as part of the project design. Confirmation (stage 5 - aimed at answering Q5): A field visit in 2005 indicated that the hybrid system had been successfully integrated into Oeledo village life, thus confirming its benefits, as demonstrated by the effectiveness of the PLD, improved per capita income (from small-scale home industries such as carpentry and ice making to preserve fish), better lighting supporting longer hours of study, shop operation, handicrafts, and evening gatherings including shared use of TV, and improved promotion prospects for PLD officials in the local government civil service. The PLD became self-reliant in the operation and maintenance of the electricity supply system, initially considered alien to the village culture. While further expansion or replication of the project was hampered by the high capital cost and repair cost of the imported equipment, the NTT government now views the PLD as a model for isolated grid utility service if funding becomes available. The ability of the PLD chair lady to envision alternative RET (a different and cheaper scheme) suggests that RET has been successfully acculturated within the local community way of life. As stated earlier, this is the cultural capital legacy of the E7 project that can provide the village with greater autonomy to participate in future RET project design. In summary, acculturation of the hybrid power system in Oeledo required a complete traverse of the KPDAC stages and both sufficient financial investment and a highly capable agent to guide the community on its journey. The careful acculturation process, despite being more resource intensive than a conventional hardware-focused approach, facilitated the blending of the hybrid power system with pre-existing Oeledo culture. This is partly due to the hybrid power system attributes, which met community expectations (meeting their low-energy service needs using locally available resources). As a generalization, the less familiar potential users are initially with RET (indicated by an early position in the KPDAC continuum - such as the unfamiliarity of the Oeledo community with solar and wind power systems), the greater the effort, resources and length of intervention required for RET acculturation, as villagers have to progress from their prior condition state, through to knowledge, persuasion, decision, and adoption stages before being able to confirm the benefits of RET and integrate RET hardware, software, and orgware into their culture. Facilitators need to understand and address these requirements and possess the knowledge, skill, and financial resources required for that purpose. 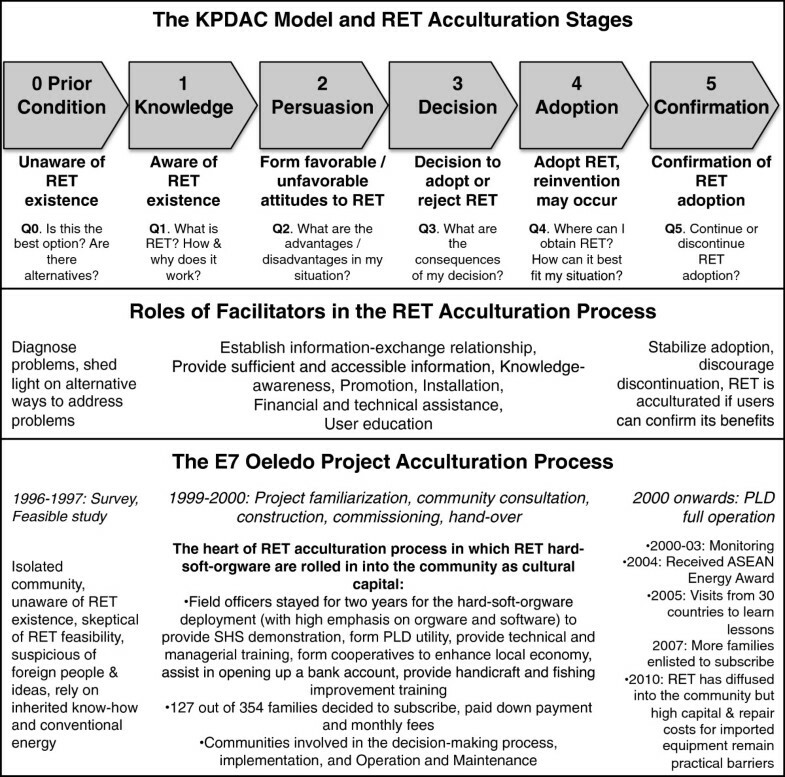 This paper has demonstrated the use of a combination of Dobrov's hardware-software-orgware , Bourdieu's cultural capital , and Rogers' innovation-decision stages  that we call the KPDAC model, to explain the components and stages in RET acculturation that resulted in RET being diffused into and assimilated by the off-grid community of Oeledo. RET should be viewed as a compound of hardware, software, and orgware rather than merely hardware; orgware and software should be transferred and consolidated prior to hardware deployment. RET should be viewed as cultural goods, rather than just consumer goods, and the RET appropriator (adopter) needs sufficient time and resources to acquire RET embodied cultural capital (software, skill, know-how) so that RET can be assimilated into local culture. The facilitator should have sufficient capacity to transfer RET cultural capital from the initial holder (project proponents) to the appropriator (village community). The facilitator should initially determine where the potential adopters reside in the KPDAC model prior to introducing RET as a novel artifact. The earlier the target community is initially located in the KPDAC model, the more time and resources the facilitator will need to guide community members through the remainder of the process to acculturate RET into community life. Similarly, RET projects that are large in scale relative to the pre-existing situation pose greater acculturation challenges than small projects. The facilitator also needs a good understanding of the pre-existing local culture to facilitate the blending, or diffusion of RET (as new cultural capital), into the culture, such that RET can be assimilated and add wealth to the community. It is also important to minimize leakage of newly appropriated cultural capital and to deter RET discontinuation so that the remote community can continue to confirm RET benefits. Thus, technology should be chosen so that, as far as possible, the hardware, software, and orgware are compatible with the pre-existing cultural capital of the community. All of the above suggests a need to change RET deployment and investment strategies from being centered on hardware to incorporating orgware and software, and to viewing off-grid communities as active rather than passive participants and as important agents of RET acculturation in their own right. The Indonesian electricity industry has grown significantly with the electrification ratio increasing sixfold from 11% in 1980 to 71% in 2011 , p. 20], reaching 159 million people in 31 years. However, this still left 70 million people in isolated regions without electricity supply in 2011. The government plans to increase the electrification ratio to 83% in 2015 and 94% in 2020 ; however, even then, about 15 million people will still lack electricity supply. The geography of the Indonesian archipelago hinders the extension of grid supply to many off-grid communities. Traditionally, the government has installed small-scale diesel generators, and by 2011, there were approximately 4,800 diesel generators , p. 21] supplying scattered customers in the outer Java islands. However, the operating cost of diesel generators is becoming more and more prohibitive due to high fuel prices and high operating and maintenance costs. At the same time, electricity tariffs remain subsidized. In 2010, Indonesia set an ambitious target of 25% renewable energy by 2025 , p. 105]. As part of the strategy, the Indonesian PLN state utility has embarked upon an ambitious off-grid target of installing 20-MWp PV by end of 2012 through its ‘100 Island Solar PV Project’ and aims to commence its 225-MWp ‘1,000 Island Solar PV Project’ in 2013 . As an established utility, PLN is in a position to provide institutional certainty to maintain the operation and maintenance of the PV hardware. In this conventional centralized context, in which PLN, as the owner of the hardware and the initial holder of the PV technology cultural capital, does not need to delegate the software and orgware of the PV operation to the local communities so long as it maintains its presence in the location where PV systems are installed. It remains of interest, however, to see the long-term sustainability of this approach in practice. Various other parties (state government, local government, cooperatives, NGOs, donors, and companies with corporate social responsibility schemes) continue to install renewable electricity generation in off-grid areas, particularly micro hydro, PV, and wind power systems. Those off-grid electrification schemes, for which operational responsibility is usually delegated to the local communities, are facing a more challenging long-term sustainability future. Fieldwork by the first author in NTT province in 2010 discovered failed PV, wind, and micro hydro systems, often after only a few years' operation. These systems were typically deployed under an ad hoc yearly budgeting system that put long-term operation of the RET project at risk, as such projects focused more on the initial hardware deployment (often with limited community training) rather than on the transfer of RET cultural capital. Combining the concepts of Dobrov, Bourdieu, and Rogers proved to be useful in understanding the requirements for successful renewable energy technology acculturation in the remote Indonesian community of Oeledo. The Oeledo experience may provide lessons on how to achieve better long-term outcomes, albeit at higher initial cost. Further studies may shed light on the applicability of the RET acculturation concept as a project design tool. This is particularly important if Indonesia is to achieve its renewable energy target as intended and may have relevance for the analysis and design of similar projects elsewhere in Indonesia and in other countries that have similar characteristics. aThe E7 was a non-profit international partnership formed by large electricity companies from the G8 countries, later renamed the E8 when another national utility joined. It is now called the Global Sustainability Electricity Partnership (http://www.globalelectricity.org/en/). bThe set of E7 Indonesian projects comprised four micro hydro systems with a total capacity of 146 kW, 200 solar home systems of 50 Wp each (totaling 10 kWp) distributed in three villages and the 22-kWp PV - 10-kW wind - 20-kVA diesel hybrid system installed in Oeledo. The set of projects were reported to benefit more than 4,000 people in eight remote villages at project completion , p. 2]. cThis section is largely based on . dAll parts of the Lontar palm tree are usable for various purposes including drink (including an alcoholic drink called neera), food (eaten raw, made as traditional sugar, or cooked as sweet dishes), medicine, construction (the trunk for hut structure, the stem for fences), and handicrafts (the leaves and the stem fiber for producing fans, hats, buckets, drinking cups, and mats) . eAnnounced at the 22nd ASEAN Ministers on Energy Meeting, 9 June 2004, Manila, Philippines, http://www.eppo.go.th/inter/phil2004/ASEAN-amem22.html. fTasks of E7 members other than RWE: Canadian Ontario Power Generation: AIJ design; American Electric Power: Financial sustainability analysis; French EDF and Canadian Hydro Quebec: Socioeconomic integration; Italian ENEL: PV-Wind hybrid system; Japanese KANSAI: Solar Home Systems; Japanese TEPCO: Micro Hydro power . gPerusahaan Listrik Negara (PLN): state electricity utility. hThis section is a revised version of material that appeared in . iOperating in the tropics at high temperature can shorten battery life. Daytime temperature in NTT province, including Oeledo, can be above 30°C. Reference  reports that a temperature above 30°C could reduce battery life by between 20% and 45%. The marine environment may also exacerbate battery corrosion. The PLD seemed dedicated to maintaining the batteries; however, we cannot rule out poor battery maintenance or poor management of over-charging situations. jThis section is a revised version of material that appeared in . lThis refers to ‘persuasion’ stage which refers to an attitude-forming stage , p. 175]. mThe term ‘implementation’ , p. 169] refers to an act of ‘adoption’ of the innovation, and we use the term ‘adoption’ in the KPDAC acronym. nA prominent example of reinvention in developing countries is the motorbike, which is often modified to meet user needs such as transporting crops or passengers or acting as a mobile workshop. oFear of compromising technical quality or breaching of IP (intellectual property) rights may be other reasons. AusAID provided funding for Dr. Retnanestri's PhD scholarship and her fieldwork, undertaken in 2005. An AusAID-funded Australian Development Research Award (ADRA) provided funding for further research and dissemination work during 2008 to 2011. Dr. Stephen Healy jointly supervised Dr. Retnanestri's PhD project and participated in the ADRA research project team. The authors are grateful to the Oeledo community and others who assisted in the research underlying this paper. MR developed the methods used in this paper as part of her PhD project at the University of New South Wales. She also conducted the field research and interviews reported in the paper and prepared the initial draft of the paper. HO was the primary supervisor for her PhD project at the University of New South Wales and provided advice throughout the work reported here. He also contributed to the writing of the paper after the initial draft stage. Both authors read and approved the final manuscript. Discover, undated: Temperature Effects on Battery Performance and Life. . Accessed 10 April 2013 http://www.discover-energy.com.